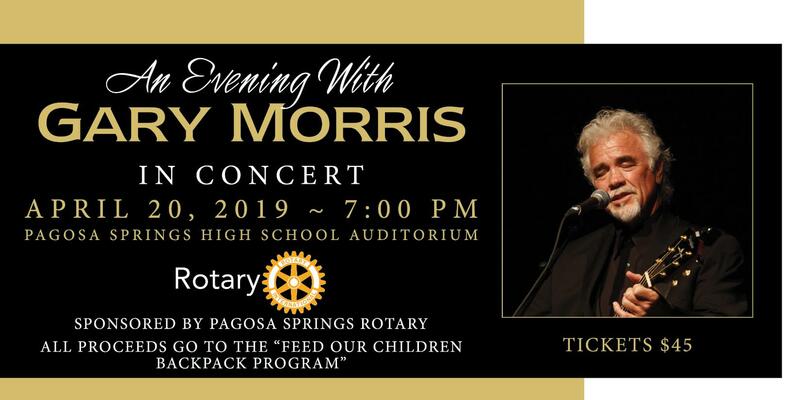 Gary Morris will be in concert on April 20th at 7:00 pm at the Pagosa Springs High School Auditorium. Doors will open at 6:00 pm. Mr. Morris has a heart for many charitable activities and one of them is our Feed Our Children Backpack Program. Pagosa Springs is not a community that readily accepts the notion that any of our children should go hungry. This program is in its eighth year of providing food for third and fourth graders to assist families who are struggling. In addition to supporting a good cause, this concert will be an opportunity to see a multi-talented, world renown singer who has captivated audiences from Nashville to Broadway to a command performance for Her Majesty Queen Elizabeth II. His recording career garnered five No. 1 and 16 top 10 singles, including “Why Lady Why,’ “The Love She Found in Me” and “Baby Bye Bye.” Please consider joining us on April 20th for this special event! Call or email me if you would like to reserve tickets at the pre-event price of $45 and we will have them for you at the door.